Are you in a search for a portable gas grill that can easily be brought along on your camping and picnic trips? There are lots of gas grill models available over the market, but choosing the one with the right balance between performance and portability can be quite tricky. Many brands have tried to deliver each own compact models. However, Stok Gridiron is one that stands out from the rest. It has a unique and distinctive design that allows it to be very portable, easy to be put in the car and then set back up. Stok Gridiron is easily the best solution for your needs! So, what makes Stok Gridiron so special? The first thing that you can immediately notice is the design. In its full form, it stands on a rugged and durable stand, which has a pair of wheels to make easy and practical mobility. However, the grill can be folded into a flat 40” x 12.5” form, which makes it easy to be slipped into any spare space available in your car. In addition, the firebox can also be locked, which is a very important feature to prevent it from accidentally opening and crashing into things in the middle of the road. Stok Gridiron comes with 338 square inches total cooking area. Well, this is huge, especially if compared to the compact nature of the grill. With such cooking area, you will be able to cook a bunch of foods at once. Cooking for a fellow crowd becomes a breeze. The heat output of the grill is 15,000 BTU per hour, which means that it has sufficient power for a variety of cooking tasks. The firebox performs an excellent job in keeping the heat level inside, and there is an integrated temperature gauge easily visible on the top of the lid. The temperature gauge is very handy for monitoring and controlling the heat level of the grill. Stok Gridiron operates using a 1-lb liquid propane (LP) gas cylinder, which is also compact and easy to be brought along in stock. On the side of the grill, you can find an integrated side table that is very handy and practical for cooking outdoor. Very convenient! Besides having a portable body and excellent cooking performance, Stok Gridiron also offers an ease of usage. The problem with many other grills is that they can be so difficult to start. You may spend over an hour in an effort of turning on the grill. 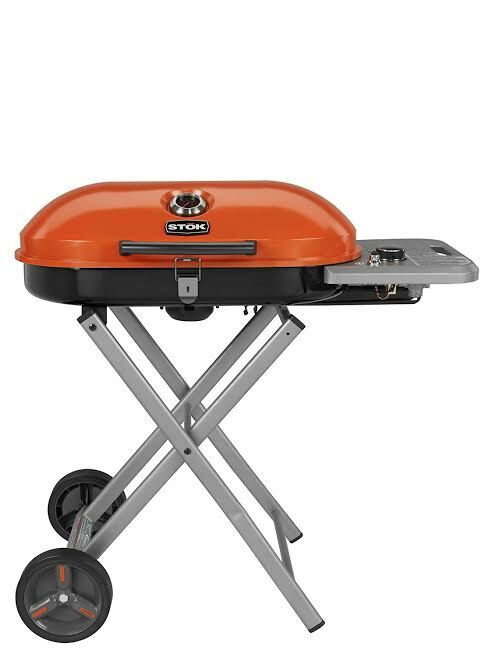 However, with Stok Gridiron, you never have to worry about difficulties in starting the grill because it has been equipped with a quick-start electric ignitor. You can get the grill going just with a flick. Keep in mind, though, that the electric ignitor works using an AA battery that can run out of power. So, you are wise to check the battery every before a camping trip. In addition, the cleaning after usage is also easy and convenient. The porcelain-coated cast-iron grate is not only very strong and durable, but also very easy to clean. All in all, Stok Gridiron is a gas grill that has excellently combined performance, convenience, and portability into one neat product. Check the best price of Stok Gridiron here!